I'm surprised they didn't point out that she was in the process of breaking the law by trying to carry a gun on a bus. I'm figuring that Dahleen Glanton does not know this. It would be interesting to get her opinion on THAT too. Perhaps she was waiting form someone to get off the bus. Perhaps she was meeting someone and walking with them. Was the bench properly posted in accordance of the law? Would the bench be "real property"? Was she transporting and had to load before defending herself? I wasn't there so I do not know the answers. Not sure if you were trying to be snarky there, but if she needed to load her handgun before she could use it in this instance, it would have been too late already. One doesn't have seconds to react in a case like this. Fractions of a second can be the difference between life and death. Even "Six Seconds to Safety" is too long. Accounts say she was carrying a loaded revolver in accordance with her CCL. I'm pretty sure the sidewalk at a bus stop is not a prohibited area. Concealed is concealed and some folks will fudge on the rules in some circumstances. I predict the mass transit prohibition will disappear, one day. I too was shocked when I saw this printed. Glanton is pretty far left but every once and a while she has a glimmer of common sense. She once wrote a column stating that most of the gun laws liberals are pushing are already law in illlinois .... and left unstated that they obviously dont reduce violent gang crimes. What does it matter if she was going to be getting on a bus or not? The fact is that she was carrying concealed legally and it happened to be at the same location as a bus stop. Anyone insinuating that she might have been getting onto a bus and carrying against the law should just start writing for the trib. I know a few people that routinely carry on Metra. If the do not break the law in this instance it would make defensive carry virtually impossible for most of the day. They have made a choice of being armed all the time, rather than only half-the time. The risk of discovery is more remote than the risk of harm. I thought I saw somewhere that she used a revolver, but the stories I found today all said .38 caliber handgun. While that could be a revolver, it could also be jumbled newsroom description of a .380 pistol. Dahleen and I have had many discussions on this topic. It's good to see this article. Yeah... I thought I read revolver somewhere, but can't find it. ".38 caliber" may just be her description to CPD. It is more likely info was gleamed from a CPD statement than some jumbled newsroom description. It looks like they have not recovered either gun. Change of direction for the Trib, or a case of a stopped clock being right twice a day? This is in reference to the Tribune's editorial about the escalating gang violence in certain sections of Chicago. One of the remedies the editorial advocates is requiring background checks for all firearms purchases, and it leaves the reader with the impression that this requirement is not being followed at gun shows or person to person sales. This is simply not the case in Illinois. My source for that is a Tribune article printed Jan. 5, 2016, by Dahleen Glanton Background checks for guns the norm in Illinois. Illinois already requires the buyer of any firearm or ammunition to have a valid Firearm Owners Identification card. This in essence is a background check ensuring the FOID card holder meets all federal and state requirements to posses a forearm or ammunition. The Illinois State Police runs background checks of all FOID card holders every 24 hours to ensure that violations have not occurred recently in effect an instant background check is run every day even if you are not purchasing a firearm. This ^^^^ and have sent the link to a couple dozen in my "e-mail group." It is good to see a nice ballanced well written article about firearms in the Tribune. I raise my glass and say cheers to Molly B. And Dahleen. I am also stunned to see this from Ms. Glanton. I am trusting my old memory here, but it was at the first of the Chicago Second Amendment Freedom Rallies in Thompson Center Plaza when Ms. Glanton, having been identified by several of us as the Trib reporter on the scene, was asked what her story was going to be. She replied with a toss that "This isn't what we expected" and as a result there would be no story. Indeed, there was not, not that I can recall. Admitting that 600 very ruly demonstrators held a peaceful rally to celebrate civil rights was not on the menu, one supposes. I have always associated Ms. Glanton with Tribune anti-gun activism and am pleased to see that perhaps some actual common sense has been arrived at. Another memory test- was not the emcee of the event Cisco Cotto, who is now a mainstay at WBBM NewsRadio, a very active anti-gun journo outlet, and the most-listened to radio station in metro Chicago? 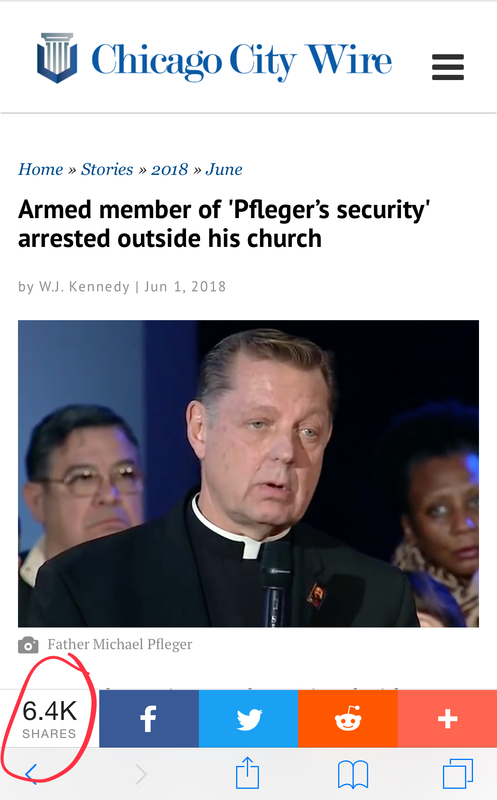 A better-still memory was Mike Pfleger being there on the sidewalk with a pair of his paid "protesters" sweating in the hot sun wearing T-shirts decrying the NRA. The NRA, while it was there, was not even a sponsor of the event, which we politely pointed out to no response. One of the guys, I forget who, offered to discuss and debate, which drew stony silence from Pfleger, Then another guy offered the three a round of cold bottled waters... which they also stonily refused. Big fun that day! One of them was Ron Holt, CPD and father of Blair Holt, who was shot on the CTA bus and is now the namesake of the Cook County Semi-Auto-Ban, and the namesake of the failed bill that Bobby Rush introduces every term.in Congress. The other was one of Pfleger's interns. I talked to Ron for a few minutes, he did not realize, or professed not to know, that most states at that time had a legal form of carry. Yes, it was very hot out, and the sun shone down directly. One of our volunteers asked me "what to do" about them and I suggested to offer them the water. We had requested that CMS leave us a roll-around garbage cart for the event, so that we could clean up when it was over. But our people left nothing behind. There was a Tribune photographer there too, Zbignew Bzak (sp). We talked for a while and I asked him why he wasn’t taking any Photos and his answer was there was nothing to see , meaning everyone was orderly. I asked if maybe photos of an orderly protest were indeed newsworthy his answer was “Ask Bruce” meaning Bruce Dold who is the editor/punlisher at the Tribune. It was plain he had his orders. IIRC that was also the year Toni Preckwinkle showed up and just stood by the street close to the CPD officers looking like she had just been sucking on a very sour pickle. It kinda looks like this particular occurrence hit home with her. She might be for changing the law. Edited by springfield shooter, 10 January 2019 - 02:42 PM. mikew, good info, things I was not aware of at the time. Yes, it was extraordinarily orderly. Probably should not have diverted the thread but Ms. Glanton's been a particular point of irritation to us in the Tribune's battle against gun rights and I had to chime in. The article says she was waiting for the bus to go to work. "Video from a surveillance camera posted outside a store nearby shows a young woman standing underneath a bus shelter shortly before 6 a.m., apparently on her way to work." Those events were a highlight for IllinoisCarry and ISRA.